Growing up, my mom was notorious for her coconut cake. Back then it didn't matter to any of us that it came from a box, was mixed with vegetable oil and was topped with canned frosting. It was good that's all we knew. Fast forward to this year; for mom's 71st birthday, I decided to try my hand at a made from scratch coconut cake. I scoured the internet for a recipe and finally decided on one from Cooks Illustrated. I added my own touches and the cake turned out beautiful. Mom loved the intense coconut flavor both in the cake and in the homemade coconut buttercream. She was happy and I can't ask for much more than that. Heat oven to 325℉. Spray two 9-inch round cake pans with cooking spray and dust with flour. Beat whole egg and egg whites in large measuring cup with fork to combine. Add coconut cream, coconut milk, vanilla, and coconut extract; beat with fork until thoroughly combined. Combine flour, sugar, baking powder, and salt in bowl of stand mixer fitted with paddle attachment. Mix on lowest speed to combine, about 30 seconds. With mixer running, add butter 1 piece at a time, then beat until mixture resembles coarse meal, with butter bits no larger than small peas, 2 to 2-1/2 minutes. Divide batter evenly between cake pans and level with offset spatula. Bake until golden brown, cakes pull away from sides of pans, and toothpick inserted into center of cakes comes out clean, about 30 minutes. Cool in pans on wire racks for 10 minutes, then loosen cakes from sides of pans with paring knife, invert cakes onto racks and then re-invert; cool to room temperature. Cream butter in a mixer with the paddle attachment on medium speed. Add powdered sugar, coconut extract, salt, and coconut cream. Beat for 3 minutes. If your frosting needs a more stiff consistency, add a little more sugar. If your frosting needs to be thinned out, add additional coconut cream 1 tablespoon at a time. My favorite cake is a chocolate bundt cake. I love chocolate cream cake the best. 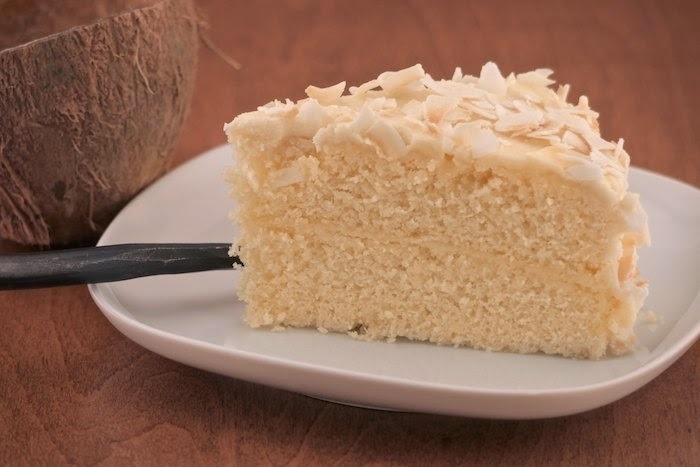 Can I choose your fabulous looking coconut cream cake as my new favorite cake?! Looks delicious! Italian Cream Cake is my favorite, especially during the holidays. Yellow cake with fudgy dark chocolate icing is my favorite. What a lovely cake and LUV that you made it from scratch. I'm always in the mood for a good, homemade cake! Beautifully done. how nice to make a coconut cake from scratch for your mom's birthday! it's beautiful. I make a Hershey's chocolate cake with peanut butter frosting.... it's SO yummy! I LOVE, LOVE, LOVE, coconut! So this cake is a dream come true to me! Every kind of coconut imaginable! Wish I didn't have to wait to bake it! Drooling! OH and COCONUT is my favorite cake!! I'm thinking that THIS is my new favorite cake. I know it would be my husband's fave - he's crazy for coconut! I think you can't go wrong w a really good chocolate cake, like a Devils Food Cake. Or a carrot cake, as long as there are no nuts in it! It look super moist and beautiful! Gorgeous cake - I just love that last picture! So glad that you had such a good example for home baking. This looks great! I would have to pick German Chocolate with Coconut Pecan frosting. love coconut cream cake, has always been one of my favorites! My favorite cake would be a chocolate ice cream cake! That just beautiful! Happy 71st birthday to your mom! I've been baking a chocolate stout cake quite often lately and can't get enough. I even add a bit of the booze to the frosting! I love how beautiful your cake looks. Congrats on making one from scratch. BTW...LOVE that spinning plate!! This looks like the perfect cake. The color is amazing and it looks so moist! My favorite is rum cake with sugar icing. I love a good coconut cake! Red Velvet is my favorite kind of cake. My favorite cake is Red Velvet, but only the kind that does not use cocoa. I prefer the one that tastes like a spice cake and has an icing made with milk that's been cooked then allowed to cool.